Join me on my New Europe Sandeman Tour of Paris. While the tours are free, they do ask that you tip the tour guides whatever you can afford to pay at the end of the tour. I did these tours throughout Europe because they were extremely informative and affordable! If you are interested in attending a free tour of Paris, then feel free to sign up here. The 5 different Parisian tours are the Free Tour of Paris Tour, Monmarte Tour, Latin Quarter Tour, Versailles tour. 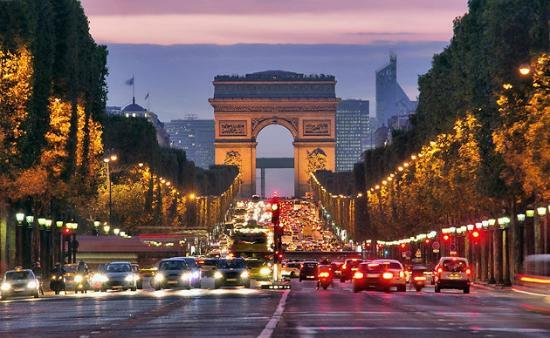 One of the most beautiful (and probably most-imitated monument) in the world is the Arc de Triomphe. Napoleon commission Jean Chalgrin to construct the arch to praise the French Army. The Arc de Triomphe Roundabout is also incredibly beautiful, and somewhat dangerous, based on the fact that that there is a roundabout with 11 entry and exit points. I literally stood by this monument and watched the traffic for 15 minutes to get a sense of the danger especially since there were no visible markings on the road. I saw cars intersecting and cutting each other off. I also saw one guy wave his fist at another car. As a law student, it made me want to look into the French insurance and tort system (lol). In any event, posted below are some tips for driving on the Etoile (name for the roundabout) for my brave viewers. If you wish to avoid the roundabout all together take the last right before the intersection on to rue de Presbourg and rue de Tilsitt. This will circle around the outside of the roundabout however it is a lot slower. You need to be a little bit pushy in order to merge off the roundabout. Don’t make any sudden decisions, you need to stay calm and be fluid with the traffic around you. Continually check your blind spots as there are often erratic drivers in Paris and many scooters slicing between narrow gaps. By the way, was the elevator as small as you imagined after reading about it in my Plugg-Inn post?